The most hygienic dispenser. The Scott Essential has no dirt traps allowing for an easy one-wipe clean. Ideal for high traffic environments where hygiene and efficiency are important. 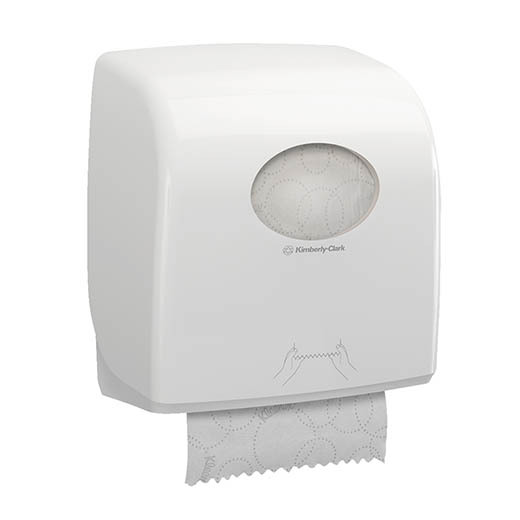 Our most hygienic dispenser vs. the competition, the AQUARIUS* SLIMROLL* Rolled Hand Towel Dispenser delivers the latest in hygiene innovation at a size comparable to many folded dispensers. Ideal for high traffic environments with limited space where hygiene and efficiency are important. This surprisingly compact dispenser has a smooth design and no dirt traps which allows for easy, one-wipe-cleaning. Plus, a never-run-out feature ensures a continuous rolled towel supply.